A while ago I went to hear Kim John Paine speak about children and learning. He is a psychologist who works with children and families with a wide variety of needs. One of his points that stuck with me had to do with how we think about differences. He asked us to think of all the people we worked with – our students and our colleagues – and he asked us to consider their quirks. After a bit of time, he pointed out that we all have quirks. They are the things about us that drive people crazy; and they are the things that make us special and endearing. We smiled and nodded knowingly. Next he reminded us that we could think of these quirks in in different ways. We could take those quirks, acknowledge them, polish and highlight them so that over time were seen as gifts. A person with them becomes gifted. Or we could take those quirks, worry them, flog and reshape them until they became raw so that over time they were seen as a disability. A person with them becomes disabled. Reading The Quirks- Welcome to Normal made me think of this presentation. The Quirks are a family of six. Grandpa has the ability to rewind time. Grandma is a fairy grandmother (literally) living in a small house in the willow tree. Mom has the ability to make you think what she wants you to think. Penelope’s imagination runs wild and comes true in real life. Finn is invisible to everyone but Molly, Penelope’s twin. And Molly’s quirk? She doesn’t have one. Because of their quirks, the family has moved around a lot. They’ve lived in twelve states and twenty-six towns in nine years (and three quarters.) Things get out of hand and the Quirks move on. Just recently they have moved into Normal, Michigan. Fourth grade will begin in a day or two for the twins. It’s an anxious time. Molly longs to fit in and stay in one place. Penelope wants that too. She is working very hard to keep her mind calm and empty, her imagination under control. It is a lot of work to fit in and hide your family’s quirks. It’s scary and frustrating and hard! The most exciting day in Normal is the fall festival. Every year the town does something extraordinarily abnormal to try to break a record. They’ve made more pancakes at one time than any other town, and they’ve built the longest graham cracker staircase in the world. So far, the town has never failed to meet the goal. Each year they collect suggestions from the townspeople, one is selected at random and then they all come together to celebrate the wild and wacky on Normal Night and break a new record. At least that’s how it normally works. They’ve never yet, but they’ve never had the Quirks in their town before either – five people who are able to do real magic, and it’s Finn’s suggestion that has been chosen. “This year, the town of Normal will by trying to build the world’s largest ball of A.B.C. on record.” This all has to happen in one night – before 10 pm. 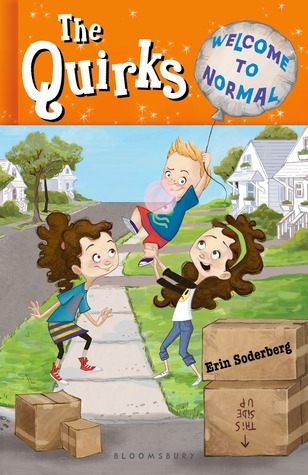 Read The Quirks- Welcome to Normal to see if the Quirks can manage their quirks so they will be able to stay. Will they polish their quirks or the quirks or hide them away? So glad you’re still around. How are things going in HS? I hope great! Yup, you would find the Quirks funny. I’m thinking you’d be Penelope and Matt would be the male counterpart of Molly. Fun! Hey Dare Dare! This looks like a book I would have loved. Sounds like a fun read! I love this blog.